Yarn bombing and guerilla knitting can be cool. Our suburb was recently bombed overnight and the outcome is fantastic. There are various forms of bombing. I’ve seen lace around trees, crochet and knitted objects surrounding parking meters and road signs. Here’s an example of crochet just like Nana did, only she made blankets and ponchos (really hip in the late ’60s, early ’70s), but I bet she never would have considered crocheting a cover for a road sign. Now this one has me a bit perplexed. Yarn bombing of a different nature. 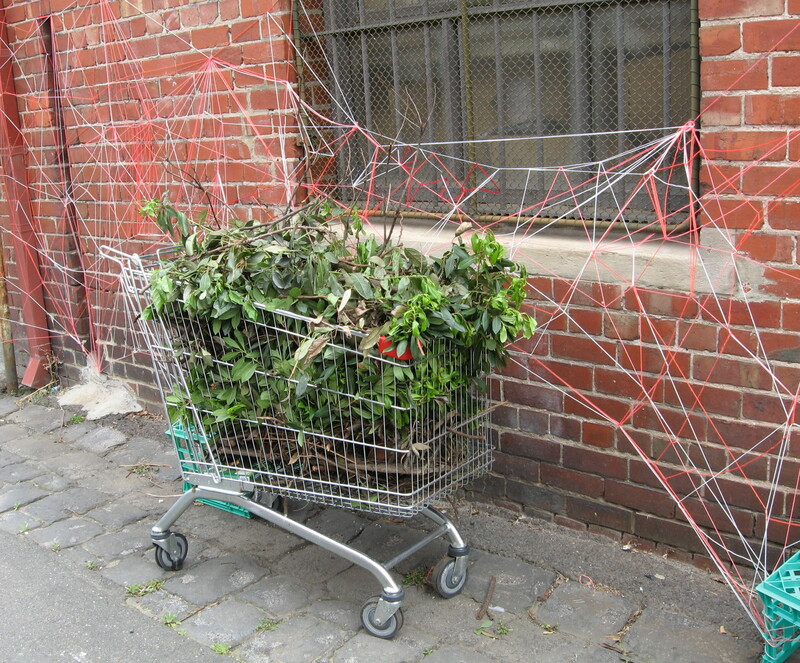 Yes, nature is in the basket but the supermarket trolley encaptured by the twine has me rather perplexed. Can anyone interpret this for me?